服務設計(Service Design)對從特定技術平台能力出身的程序設計師來說, 這是最感到親切與狂熱的一部份, 老魚也是, 管理者是不是也應該曾經是或現在仍是位技術者出身? 這個問題至今仍是二派說法, 但無論如何, 事情總是要有人做. Apache Tuscany 提供全方位的開源SOA基礎架構以利於開發, 組裝, 發佈, 管理組件式應用服務(Composite Applications)及 Data 處理. 該 Project 實現服務組件體系(SCA: Service Component Architecture)和服務資料物件(SDO: Service Data Objects)等 OASIS OpenCSA(http://www.oasis-opencsa.org/ ) 標準. Tuscany Java SCA is a lightweight runtime that is designed to run standalone or provisioned to different host environments. The modularized architecture allows users to pick and choose modules that cater to their business needs therefore resulting in small footprint. At a high level,Tuscany Java SCA infrastructure can be divided into two categories of modules: core and extensions. The core modules consist of selectable components that provide support for SCA and data handling as well as the core runtime. The core runtime includes functions such as loading system and application services, building and managing composites. The extension category consists of a set of selectable modules that support integration of various technologies that are required in SOA environment. This includes support for various protocols through bindings, programming languages through implementations, data types, security and transaction through policies. This whole thing constitutes an SCA node. 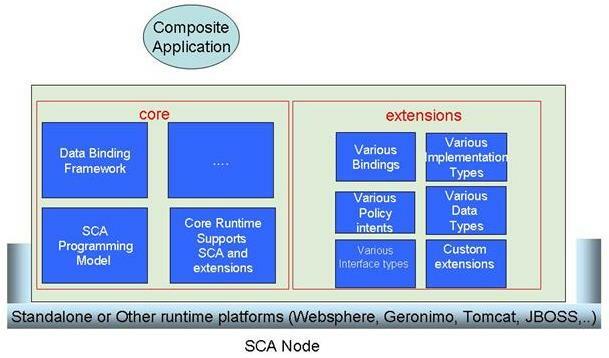 An SCA composite application can be spread across multiple nodes in a cloud or be run on a single node. This administrative scope is referred to as the SCA domain. The EclipseLink SDO component delivers the reference implementation of the Service Data Objects (SDO) 2.1.1. The EclipseLink SDO implementation enables Java developer to efficiently build and use data object models that can be incorporated into service architectures. This JSR will develop an API for providing support for RESTful(Representational State Transfer) Web Services in the Java Platform. Apache CXF is an open source services framework. CXF helps you build and develop services using frontend programming APIs, like JAX-WS. These services can speak a variety of protocols such as SOAP, XML/HTTP, RESTful HTTP, or CORBA and work over a variety of transports such as HTTP, JMS or JBI.